On Tuesday, Think Progress reported on a number of companies that offered discounts or perks to members of the National Rifle Association. The list—along with the activism from victims of last week’s high school mass shooting in Parkland—seemed to help prompt a Twitter boycott of some of those companies. Less than a week later, that boycott has caused the vast majority of these companies to say that they are severing ties with the NRA. [S]ome corporations have decided to punish NRA membership in a shameful display of political and civic cowardice. In time, these brands will be replaced by others who recognize that patriotism and determined commitment to Constitutional freedoms are characteristics of a marketplace they very much want to serve. The flood of fleeing companies began on Thursday when the First National Bank of Omaha said it would not renew a contract for its “NRA Visa Card.” On Saturday, United Airlines and Delta Airlines each said they were ending a contract for discounted rates for group travel for NRA members. 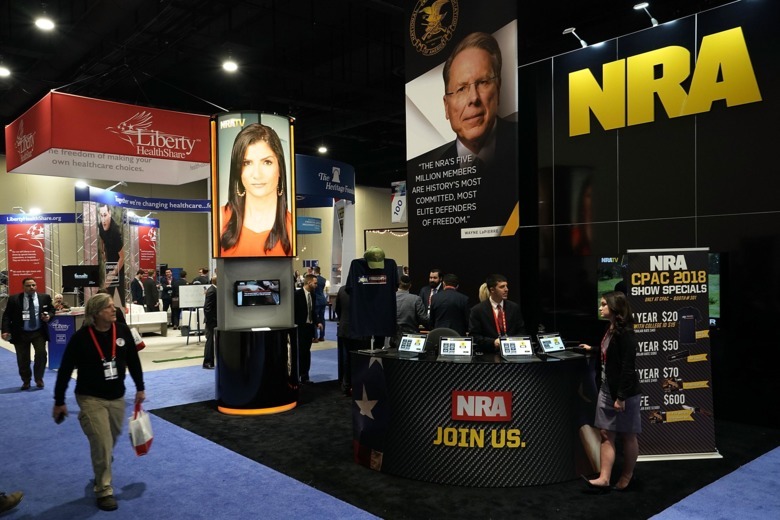 The direct advocacy against companies that offer discounts to NRA members has not been the only financial consequence of the wave activism in the wake of the Parkland shooting. These discount providers, indeed, are not the lobbying group’s biggest corporate supporters. Those are obviously gun manufacturers. Axios reported that Bank of America had taken one step to reconsidering its relationship with companies that manufacture assault weapons for non-military use. Bloomberg News, meanwhile, reported that BlackRock Inc. was considering limited steps to remove gun companies from certain investment portfolios for people who didn’t want to invest in them. More than $845 billion of U.S. institutional assets restricted investments were in weapons as of the start of 2016, according to data from US SIF, the Forum for Sustainable and Responsible Investment. That number soared more than 1,000 percent following the Sandy Hook school shooting in December 2012, from $74 billion at the start of 2012. If the #BoycottNRA activism that has been so successful on Twitter in the past few days is going to have a lasting impact, the financial system is where these activists may have to try to turn next.